I’ve quoted the reviews exactly as they were written but have omitted some off-topic passages, such as where people were placing bets on how long it would take them to load the trailer. In each case I’ve given the link at the bottom of the post so people can go to the original thread if they want. In the interest of full disclosure:- MovingScam is receiving a referral fee from U-Pack for every move with U-Pack that is booked from this website. For a long time, Tim Walker (founder of the website) resisted taking such referral fees, but it became obvious that consumers' voluntary donations would never cover the costs involved in running the website. We hope that readers will understand that MovingScam would never enter into such arrangements with any company that Tim was not completely convinced was ethical. The other companies that MovingScam is receiving referral fees from are the international moving companies recommended on the International Moves slider, the full-service movers Moovers, Inc., All Star Moving, Joyce Van Lines, and (in the future) STS Movers, the auto transporters Coast to Coast Auto Transport and Golden Key Express, and the auto transport broker ProStar at http://www.shipmycar.com. In the spring of 2010, Tim added Atlas SmartMove to the list of endorsed companies. I also wanted to make people aware that if they don't make their reservation with U-Pack by clicking over directly to upack.com from MovingScam.com, this website will not get credit for the move. However, they can call U-Pack after the fact at 1-800-355-1696 and ask that the move be credited to MovingScam.com under referral number 2149. This will allow our website to continue helping others. Thank you. At the suggestion of a reader ("peterpqa"), at the beginning of each review I've categorized the reviewer's opinion of U-Pack as "recommended" - "neutral" - or "not recommended." The "not recommended" (bad) reviews are #38, #39. #43, #49, #58, #73, #77, #133, #150, and #161. The "neutral" reviews are #2, #3, #5, #18, and #68. We know that many more people used U-Packthan are represented here, but they didn’t report back to us. I try to round them up so we will have a record. But sometimes people change their email addresses when they move and we lose track of them. Note that a few reviews were originally posted on Epinions and I re-posted them here because they talked about MovingScam.com or raised an important issue. There are fewer U-Pack reviews than Broadway Express reviews posted on MovingScam.com because all of the U-Pack reviews were unsolicited, whereas about 80% of the BE reviews were the result of my writing to customers at email addresses supplied by BE and asking them to post. Only about 20% were posted spontaneously. U-Pack did not supply me with any email addresses. I hope this will be helpful to people trying to decide how to move. Any comments or suggestions for improvement are very welcome. A detailed FAQ sheet on U-Pack and BE is at viewtopic.php?t=1771. Also, please note that there are currently almost 150 reviews of U-Pack on the consumer advocacy website Epinions.com – go to http://www.epinions.com/hmgd-Moving_Ser ... y_~reviews to see them. You can’t see all the reviews unless you sign up as a member; otherwise the shorter or less helpful reviews are omitted. UPDATE: As of late August 2005, the minimum linear footage charged for by U-Pack U-Pack is 5 feet regardless of whether the shipment is door-to-door, terminal-to-terminal, or any combination of the two. * Follow up phone conversations with a confirming email. * Be flexible and don't schedule things too tightly. * Make sure that you have all the equipment needed to load. * Ask the driver to help with the ramp and bulkhead if necessary. * Make sure that you can be reached by phone. * Be mindful of parking issues. * When the truck arrives, inspect it before loading. * Have all your packing finished before the truck is loaded. * Understand that you are moving with a freight company. * Be very careful while working in or around the trailer. * Follow up phone conversations with a confirming email. Get the names of the people you talk with on the phone at U-Pack and send them a follow-up email summarizing the points discussed and asking for a reply that confirms or corrects your understanding. * Be flexible and don’t schedule things too tightly. Ask yourself what would happen if the trailer was delivered a few hours later than scheduled, especially in a “live load” or “live unload” situation where the driver waits with the trailer. If you hire helpers, find out what their policy is on charging for waiting time or coming back later if necessary. And be sensible--if you schedule a move for the exact day that you have to be out of your old residence, you are tempting fate. * Make sure that you have all the equipment needed to load, including dollies, a ladder, moving pads, tarps or shrink-wrap to protect against water and dust, and tie-down straps if you use them. * Ask the driver to help with the ramp and bulkhead if necessary. The ramp is heavy and the bulkhead can be tricky to install and remove. The U-Pack drivers are motivated to keep things moving and will help you if asked to do so, without expecting to be tipped. * Make sure that you can be reached by phone. Some people have had problems when they disconnected their regular phone service, or their cell phone service cut out, or they didn’t check their messages frequently enough. It’s a good idea to give U-Pack at least two contact phone numbers, not just one. * Be mindful of parking issues. The U-Pack trucks cannot park where there are low overhanging branches that could damage the roof and they must leave space for the ramp to be installed. They must also be parked so that they do not block you from moving large items out the door of your residence. Discuss parking with your local police department and get the proper permits if necessary, or block off three car lengths with your vehicles and your friends’ vehicles so the U-Pack driver will have room to park. * When the truck arrives, inspect it before loading and have a camera available with plenty of film or storage. If the trailer is in less than ideal condition (for example if it is very dirty or splintery or there is a hole in the roof), call the terminal to have a new one sent out. If you decide not to ask for a replacement trailer, photograph anything that seems problematic and make a note of it on the Bill of Lading that the driver will ask you to sign. * Have all your packing finished before the truck is loaded so that you can be out at the trailer supervising the entire loading process. Then if there are items that you are especially concerned about, you can ask your helpers to take special care with them. You can also observe how they are wrapped and loaded and if there is damage you will have a pretty good idea who caused it. * Understand that you are moving with a freight company and not with a full-service household mover. Remember that you—not U-Pack—are responsible for any breakage, scratches, rubs, and dents that may occur during your move. Only if there is catastrophic damage or negligent damage such as water damage from a roof leak is U-Pack responsible. * Be very careful while working in or around the trailer. You could fall off the trailer or the ramp. Be alert. Last edited by Diane on Thu Mar 15, 2012 2:22 pm, edited 174 times in total. You call U-Pack to pick up the trailer, they add the freight and drive to your destination, and you jointly schedule delivery of your goods at your new residence so that you can remove the bulkhead and offload. You can either have them leave the trailer for another two days, locking the trailer at night with an extra-long-shank padlock that you provide, or you can offload while the driver waits (in our case they allowed us an hour to do this without imposing a charge). If the driver waits, you must be sure to have people standing by to help you offload quickly. Importantly, your things never leave the trailer in which you loaded them. They are also divided from the other goods in the trailer by a secure bulkhead rather than by rope or cardboard (some other companies I spoke with said they did the latter). And since you have control over how your things are packed, you have control over how many linear feet you use in the trailer, measured from the end next to the cab (this linear-foot measurement plus distance is how you are charged for the move). You also have a lot of influence over whether your things arrive undamaged, since you are the one who packed them. The price is much lower than for a full-service mover. We paid just over $900 for 5 feet of furniture (8 feet wide and 9 feet high) to be moved 1100 miles. Local movers to help us unload cost another $150, plus tip, for two men for two hours. I have to report that during our move, there was a small glitch involving the bulkhead. One of its load bars (used to hold the bulkhead in place against the sides of the truck) wasn't working properly at the city of origin. I reported this to the dispatcher but it wasn’t fixed. Instead, when the driver came back for the truck, he ratcheted the load bar repeatedly so that it finally held. But then, when we tried to remove the bulkhead at the destination, neither we nor the driver could do so because the load bar had been ratcheted too tightly. Meanwhile two men from a local moving company were standing by to unload the goods and the clock was ticking. Finally they and the driver were able to dislodge the bulkhead by brute force, but it was a tense situation for a while. Since other people commenting on U-Pack on this site mention problems with the bulkhead, I think this may be a weak link in U-Pack’s otherwise excellent operation. I feel that the company should have a system in place so that when a customer reports a problem with a bulkhead, that bulkhead is replaced at the city of origin rather than leaving the customer to cope with the same problem at the destination city. Perhaps the bulkheads could even be examined on a regular basis to make sure that the load bars are functioning properly. However, all in all, the U-Pack service was outstanding. Their Website is excellent and all U-Pack personnel that I dealt with were professional, friendly, and helpful. They delivered the trailer when they said they would and picked it up when I asked them to. The trailer was very clean and it had a translucent fiberglass top which allowed light to pass through, making it easy to see to pack. I was able to track our shipment on the U-Pack website and they delivered it exactly when they said they would—four business days after pickup. I feel that U-Pack is providing a great service to consumers in this age of essentially unregulated moving companies that can literally take your things and hold them for ransom (see the website http://www.movingscam.com for some background and a few horror stories). Based on my experience, I highly recommend this company, especially to people who have moderately-priced household goods and are concerned about cost and maintaining control of their shipments. In a separate post, “Our excellent experience with ABF,” I have outlined how ABF works and have described our very positive experience with the company on a small interstate move of about 1100 miles. We give ABF our highest recommendation. In this posting I will offer some practical pointers that may be helpful to others using this service. 1. First of all, finding a legal place to park a 28-foot trailer for two days, or at least overnight, in the city of origin can be a problem. I suggest contacting your local police department for advice. They may help you by setting out cones or you may have to find off-street parking. In some cases you may have to take your things in a van to a local ABF depot to load them there rather than at your residence. Parking the trailer at destination is usually not as much of a problem since you can offload while the driver waits by hiring local movers to stand by (as I did). ABF gave me one hour to offload; after that they said they would have charged me for the driver’s time. 3. The point is that amateurs don’t really know how to pack to prevent such damage. If you want to move expensive things, I suggest having a professional check the way you are loading them. Also, don’t skimp on the moving pads and packing materials. There is a temptation to do so because you are paying by the linear foot, but don’t do it. Make a diagram of the 8-foot-wide 9-foot-high space, measure your larger pieces with a yardstick, and have a plan as to how you are going to load. Put heavy things at the bottom and wedge things in tightly (I used a lot of pillows to do this). In our case what worked best was to stand the sofa on end in one corner to take advantage of the trailer height and also stand the mattress and box spring on end just behind the bulkhead so that they were holding the rest of the shipment in place. One driver told me that a common form of damage is abrasion on the sides of furniture where it rubs against the trailer walls in transit. All such surfaces should be protected with pads—old mattress pads work well. 4. I think it would be risky to move expensive upholstered pieces because the trailers can be dusty. Several people on this site and elsewhere have remarked that there was printer toner dust in their ABF trailers. There was some in ours as well—not much, but enough so that if I dropped a pillow on the floor a faint black mark was left on it. (The dust washed out, but not easily.) The floors of the trailers have metal ridges which are clean but the dust hides in the furrows between the ridges. Also, I noticed that although the trailer was very clean when it was delivered, there was a small amount of “road dust” or “blow dirt” (dirt mixed with dried grass) on the floor near the cab end at the destination city. Mattresses and box springs should definitely be covered. We did not, however, cover the whole shipment with a tarp or put a tarp on the floor as some people have recommended. This was mainly because we visually inspected the trailer and saw that it was clean and there were no tears in the fiberglass roof that could let rain in. If you get a dirty or dilapidated trailer, or one with holes in the roof, call the company immediately and ask for a replacement. We had our trailer dropped off midweek and not in the busy end-of-the-month period, which may have helped us get not only a better rate but also a better trailer. 5. To make it easier to load the trailer, have a 4-foot stepladder available at the city of origin. You are going to be filling a space 9 feet high. If you don’t have a stepladder, you are probably going to end up throwing light things like chairs on top at the very end rather than positioning them carefully. That is how a few of our things got scraped up a bit. At least we didn’t throw a bicycle on top, which one driver told us people sometimes do. He said that the pedals, chain, and brake controls can do a lot of damage to surfaces and that bikes should be very well wrapped. 6. Be sure to look at the excellent videos on the ABF website so you’ll know how to set up the ramp and position the bulkhead. You can’t count on the drivers to know these things (although ours were very nice and helped us maneuver the ramp and set up/take down the bulkhead, which I don’t think they are required to do). In our case the ramp was turned the wrong way in the trailer and the driver had no idea how to make it work, so we were glad we did. You can select between videos using the menu button in the top left of the screen. Be sure to come back and use one of our U-Pack links to setup your move, as it helps support this site! 7. I bought a “fold-away” (collapsible) aluminum hand truck for use during the move and it was very useful. The local movers really appreciated it when they were moving things into our new residence, and it took them less time so our cost was less. The one I bought (Safco 250 Lb. Capacity Folding Hand Truck, 4061) cost only $40 at Staples. Now, with the moving season upon us, I think they are charging closer to $50. But it’s worth it—much better than renting. Sorry for the long post but considering the extreme stress surrounding moving, I thought I would try to ease it a little by sharing some experiences and suggestions. Good luck! I am a San Jose, CA refugee. I am planning a move to Austin, TX. After diligently watching this board and Moving Advocacy Team for the last six months I have decided to AVOID MOVERS at all costs. It is just not worth it. I have been looking at ABF because I don’t mind packing myself but I don’t want to drive. If you decide to go with ABF check out the feedback on epinions.com. A lot of the people who have used this service have left great tips in their feedback. You will get a lot of information on the pros and cons of this service from people who have used it. Also order the video they will send you for free. You may want to consider using ABF Upack. You can even load your stuff at the depot instead of worrying about parking the truck/trailer at an apartment complex with parking issues. ABF has a depot in Santa Clara and they are really accommodating there. I actually went there to inspect the depot before reserving a trailer. It should cost about 100 bucks per foot of trailer space used. One of the trailers I inspected had a small tractor/lawnmower in it so it may be possible to load your motorcycle in it. I am sure there is a way to secure it in there- build a crate maybe. Or secure it with a separate divider. That said, drive yourself and the dogs in your car. PS. Go to the post office and get a "change of address" packet. There is a coupon for 50 bucks of ABF. PSS. If you use ABF, pack everything well and in plastic bags inside the boxes. Wrap everything in plastic tarps after the truck is packed to protect against water damage should the roof leak. I just moved from California to Texas . . . I used ABF (which should be renamed MAB for "my aching back") and the move went well considering all the obstacles. I plan to help out by writing up some advice based on my experience. I should have it posted in about a week. 1. Power and telephone lines. Are they high enough for the truck to drive under them or park the trailer under? My telephone lines were too low and we had to raise them with a very long 2X4 so the truck to drive under them. I don't recommend you all try this one. My land lord is an electrician so he kinda knew what he was doing....kinda. 2. Are you moving around a holiday? I moved during a three day work week for ABF. The truck was expected Monday morning and didn't arrive till Mon evening during a horrible storm. I think the truck would have been on time during a normal work week. I moved between Xmas and New Years. Really bad timing. 3. Check all your equipment when it is delivered. One divider was missing a rubber foot. Didn't notice till the second day. I called immediately and a new one was delivered within a couple of hours. It was really important that I told them right away because the pickup driver will not have room to carry one on his truck. I still have more to move and I think I will check into Broadway Express. The ABF move was just too hard on my back. PS. Anyone who needs advice on how to pack the truck can email me at t4design @ hotmail.com. I know what a big mystery it can seem like when you haven't done it yet. I would be happy to help. Then I checked into ABF U-Pack movers. Since my husband and I don't seem to have a whole lot of stuff, we think we can manage this method of shipping, plus your community seems to be comfortable with this organization. . . . I checked out Broadway Express, and since I live in downtown Washington, DC - I am concerned about finding space for a huge truck. I actually saw one of ABF's in my neighborhood today, it looks smaller than the average tractor trailer. BE's online quote was less expensive - $1430 for 10 linear feet, vs. around $1650 from ABF for only 7. Plus, like you say, the ramp is extra for $75 on both ends. Plus no help from the driver. I'm a bit worried about figuring out the bulkhead, but maybe he'll explain it to me. I've made the reservation for the trailer to be dropped off on Monday, April 12th, and they say it'll stay there until Wednesday the 14th. I'll let you all know how it went! I wanted to answer "WestCoastBound"'s question about the truck being on the street for two days. I went to my local police station, and asked for those "emergency - do not park" signs, and he gave them to me with no problem. He said to call there 72 hours beforehand so they can put it on a list, and then put them up. He said it wasn't a problem for the container to stay there for two days. Even though I live on Capitol Hill, during the day, in the middle of the week, the street is relatively free of traffic and parked cars. So I'm not too worried about finding a spot for the container. So the big move is Monday the 12th. I'll post and let you know how it went! So I wanted to follow up and tell people how our experience went with ABF-Upack. We had hired two guys to help move the heavy boxes and furniture, but they did not have any experience with loading household goods, and neither did we. So the biggest problem we had was how to load our stuff on the truck to utilize the space allotted and protect our belongings from damage. I had originally signed on for 7 linear feet at a cost of about $1600, based on the fact that we had a small townhouse with one bedroom. I thought that would be more than enough space on the truck. At first, while the guys were loading they weren't using the height of the truck, and we were using double the amount of space I had planned to. So I asked the guys to re-arrange the boxes, to utilize the height of the truck. So that involved stacking furniture and boxes really high in the back, and stair stepping down to the front. Then we couldn't figure out how to utilize the height of the truck without the high boxes flying down onto the lower things during the drive. So all this re-arranging took many many hours, and involved stepping on the boxes below to get to the boxes above, and alot of them got smushed by our weight. Then despite our best efforts at economizing the space, we ended up using 11 linear feet, at a cost of about $2300. When the truck arrived in California, it seemed as if a few of the high boxes did fall down. We tried to put our not fragile boxes on the top, so that if they fell it wouldn't matter too much. We haven't unpacked yet, since our stuff is in storage, so I don't know the extent of the damage. So, in the end, the best thing I can say is that it got the job done. It ended up costing me more than I thought it would, but I guess, still not as much as a full service mover. I think I wish I'd used Broadway Express, because from what I've read on this site, and from talking to their dispatcher, their driver will help load your stuff, or at least give advice as to the best way to load. That was our biggest problem, and biggest time-eater. Just for the record, I wasn't surprised or upset by the increase in the cost (bummed, maybe). What we paid was still far less that what we would have paid if we had gone with a mover that charges by the weight. My husband is an academic, and has lots and lots and lots of heavy books. I knew that this would add up quick. That route would have probably cost us in excess of $4000, according to all the estimates I received. Plus, I was very frustrated by the fact that I just couldn't find a reputable mover, and I was running out of time. I take full responsibility for how the packing was done. I wish I had been better able or equipped to pack the truck more efficiently, but we did the best job we could. I think the next time we move we'll just have a bon-fire in the driveway and start off fresh! I did have some additional expenses. I paid about $25 per hour for the two helpers and they helped for about 3 hours. Not too bad, I thought. I would recommend the DIY moving method to people, but I would just caution them that arranging their belongings in the truck is a skill not easily acquired the first time out. And then any damage done to your belongings, will be no one's fault but your own. I decided to go with ABF for my move at the end of the month. Each time I have spoken with them on the phone, they have been polite and very patient with the plethora of questions I ask. For 7 linear feet and ramps, my total came to $1,253. After making my reservation online, I contacted them to confirm and to once again go over my dates. Because I physically won't be arriving in Florida until the day the trailer arrives, he told me that they would hold/store my things for 2 days at no charge should I need extra time getting my apartment ready. I am sure this is their standard practice but it is nice to know that I have two days leeway. . . .
Once my moving experience is over, I will be sure to report back here and let you all know how it went. They will be dropping off the trailer on June 22 and were even willing to coordinate the best time of day for me within a 2 hour window. First of all, I am glad to have found this site and board to assist me in my decision for a mover. As most of you know, I went with ABF, a U-Pack We-Ship type company. My experience from the beginning with them has been great. They dropped the trailer off yesterday morning and the driver couldn't have been more helpful. He went over with me how to measure my allotted space and even set up the ramp I had rented. The trailer was only 28-feet long so it did not seem as overwhelming as I thought it would. He even viewed the items I would be packing and provided advice on how to load them as to prevent any shifting or damage. He also advised on the most common mistakes people make when packing items. Except for my furniture, I packed all my belongings into action packers that would stack easily and be reusable in the future. We also found thick plastic mattress bags at our local hardware store which we used to put the mattress and box spring in. Instead of renting furniture blankets, I purchased those egg foam mattress pads to wrap mirrors and furniture. They actually worked out great and were very inexpensive. The only problem was when the trailer was dropped off yesterday, they didn't have the bulkheads. However, this worked out great as they weren't in the way and we didn't have to find a place to store them during the process of loading. We had monsoons on and off here yesterday and finding a dry place to keep them would have been a pain. ABF brought the bulkheads over today and even installed them. They said my packing had been well thought out and that I came up with some creative solutions that were inexpensive yet effective. The true test will come when I remove the bulkheads in Florida. But thus far, I am very pleased with my ABF experience and I am glad that people on this board assisted in my decision making process. Thanks again for the advice and guidance. Let's just hope it ends as smoothly as it began. The one thing a person needs to keep in mind when going with a mover such as this is that you have to do a lot of the leg work. But the way I look at it, you have a lot of control of the loading and placement of your items preventing a lot of unwanted damage. Action packers (that's what I call them) are Sterilite or Rubbermaid containers with lids that more or less snap on or lock on (there are other brands, just can't think of them right now). More or less they are large, heavy duty plastic storage bins/containers. I went this route instead of using boxes due to their durability and reusability. This makes stacking them a lot easier as well. Before putting the lid on each container, I cut out a piece of egg foam for extra protection since I knew there would be another container stacked on top. I bought the containers at WalMart. 25 gallon containers were $3.44 and 31 gallon containers were around $7. Just depends on the brand you use. The only thing not packed in containers was the furniture. I put everything in them. Bubble wrap is also a very good investment. I got 1,000 feet of it at Staples for around 9.99. As far as common mistakes, the driver stated that people often pack the heaviest items on top with the lighter ones on the bottom. This often means they fall or there is a greater chance for such an instance. People often make mistakes with stacking furniture. He suggested to us, after see the furniture we had, that we load a couch on each side (I had 2), place the mattresses up against the bulkhead (the very back of the truck), then place the more fragile items in the area between the two couches. He said people don't realize there are some inexpensive investments you can make on packing materials to save yourself a lot of time in the end. He also suggested securing a tarp to the floor to protect the bottom of items placed on the floor. The trailer we received was clean but we did it anyway because of some antique furniture I am sending down. That's all I can think of right now. But please feel free to ask any more questions you may have and good luck with the move. It honestly was not as bad as I thought it would be. If you use containers like I did, and secure them shut with shrink wrap or tape, it is a cinch. . . .
My belongings are in transit as we speak. I don't know if I stated this before but the trailer they dropped off was 28 feet. Yesterday, they brought a 48 foot trailer to drop off the bulkheads. I couldn't believe how massive that thing was. Needless to say, I am thankful I got the smaller one as it will cause less problems in my apartment community. Luckily, I had quite a bit of help loading the trailer here in NJ. I contacted my APT community to recommend a local company to assist in the unloading and spoke with them yesterday. What I like about them is that there is no minimum charge, such as 4 hour minimum. They charge $120 for the first hour than $80 every hour there after. I don't know if that is reasonable or not but considering it will be summer in Florida and I am living on the third floor, it is fine with me. When I told him how long it took to load, he didn't think it would take more than an hour to unload. I believe the company is located in St. Pete so if you want their info, let me know. The gentleman was very nice considering I wasn't sure when the trailer would arrive exactly. I took photos of the trailer, inside and out, along with the ramp and bulkhead if you would like them. . . . If you want the photos, let me know. Glad that I was able to assist some of you. I just checked on the location of my shipment with the tracking number provided by ABF and my "stuff" is currently in Georgia. This is good news for me since I need my things in FL by Wednesday. I have no doubt they will make it. I too am curious how my things will arrive and whether or not my over-zealous packing strategy pays off. It was a bit time consuming but less stressful knowing all items in the containers were packed in good and tight. If you can purchase shrink wrap, that works really well to keep the containers lids on good and tight and it is easy to use if it you can get it in the 6 inch rolls. . . . I have had some pretty terrible experiences with tape not wanting to come off of certain surfaces and it can be a real pain in the you know what. I wasn't crazy about removing the dresser drawers from my furniture and I knew I didn't want to tape them shut, especially antique furniture. I found these rolls of shrink wrap, they look like a roll of toilet paper on 3 inch broom handle. In all, I shrink wrapped 2 large dressers and about 20 action packers and still had a little less than half a roll of shrink wrap left. So yes, this is great stuff and you can cut it right off. No peeling needed. Additionally, it sticks to itself so you don't need tape! Another added bonus. If I can find the name of the brand I used, I will post it on here. . . . I think masking tape is the Devil and should be avoided when packing. From personal experience, it is next to impossible to get off most surfaces. We have to use straight razors and heat guns just to get it off of glass and tile. And still, we weren't always successful. But I think IMP brought up a good point about something as simple as tape. One should be careful when using certain types of tape. I didn't know there were so many choices, including heat resistant, plastic resistant, etc. Now I know why so many companies use shrink wrap. [I held the egg carton stuff around my furniture with] shrink wrap. The only time I used tape was when I was wrapping items in bubblewrap to be packed into the action packers. Once you get the shrink wrap around the first time, it is smooth sailing from there. You just have pull nice a tight. It was actually fun to see how the stuff works. Just checked the ABF website and my trailer is due to arrive in Tampa tonight at 6:45 pm. Nice to know that it will be there. Greetings to all. I am sure that some of you have been awaiting the finale to my move with ABF. Considering it is 11:00 pm on a Saturday night, I will keep my comments brief for now and go in to detail later. All in all, I must say that you get what you pay for and I don't have any complaints. You truly must go into this with an open mind and take great precautions when packing and loading your items. Some of my furniture suffered minor scratches but that was my fault, not theirs. My brother loaded something on top of a dresser he shouldn't have and a scratch occurred. All of my items arrived in tact, except for a few candles which were a bit deformed from the heat. I should have just bought them down here but I can't resist a SALE!!! Another thing to keep in mind is that this is an extremely busy time of year for moving. I believe Diane or someone stated before that "inconvenience" isn't your items arriving a few hours late. Mine were supposed to arrive at 1:00pm but they show up at 5:00pm. Luckily, I had great movers who worked with my scheduled and came back the next morning since there was no trailer to unload when they arrived at 2:00pm. Keep in mind, I tried to keep all this coordinated while on Amtrak's Auto Train to Florida. I really got off easy. I didn't have to drive my car or my belongings down here. I did receive some great advice from the three gentlemen who unloaded my trailer (and their price was a steal, especially with three flights of stairs to carry my things up.) When I opened the trailer, they informed me as to why some of my items had shifted. I didn't pack tight enough or high enough. They said people are afraid to pack to the ceiling for some reason. However, this is just one moving company's opinion. And what I mean by moving company is an outfit that moves people’s belongings on and off of trailers. They were phenomenal and worth every cent! All in all, I would go with ABF again. Due to the high volume of moves, they didn't have a ramp here in Tampa for me but it still worked out. I contacted ABF about 10 times in one day and each time they were courteous and never seemed irritated. Again, people just need to understand that this is a very busy time of year and you deal with it the best that you can. I called them 3 days in advance of my delivery and each day until it was delivered just to go over details and possibly delivery times. I didn't realize that your delivery time also depends on what else is on the truck and whether or not that freight has been unloaded yet. If I am rambling, forgive me. It has been a very long week. The best advice I received was from my dad. He told me to go out and buy one of those large plastic painting tarps (you can find them at Wal Mart for about $5). He told me to spread it out on the carpet in the living and bedrooms. At first I thought this was odd but afterward it made sense. Those containers got a bit dirty and dusty and the tarp kept all this dirt off my brand new carpet. Plus, after walking in and out of the trailer so many times, people’s shoes get dirty. Keeps the grease off as well! Less mess for you to clean up! Well, that's all for now. I know someone mentioned they are getting ready to use ABF so let me know if I can answer any questions or if anyone else has questions about my move. I am more than happy to assist and answer in any way I can. Greetings! Sorry for the delay in getting back to you regarding my move with ABF to Tampa. Ever since the truck was unloaded, life has been non-stop and work has been non-stop. Haven’t really had much time to enjoy my new apartment. As stated before, my move with ABF went well. There were a few snafus but again, as Diane stated, this is their busiest time of year and I just happened to move during this time. If you plan well and go into a do it yourself move with patience, knowledge, and understanding, you will make out just fine. Some things are just out of your control and you have to roll with the punches. Luckily, I didn’t have too many of them. Other than a ramp not being available, ABF was great. As stated before, I must have called them 15 times one day and each time, they were polite and courteous. I thought not having a ramp would be a problem but the movers (unloaders) I hired were able to get the job done in 45 minutes, including the walk up three flights of stairs. My mother and I just watched in amazement. I guess over time, they have developed a system. I just stayed out of their way. The name of the company is Purple People Movers and I believe they are based in St. Petersburg or Tampa. What was interesting is how they carry items up stairs: on their backs. I forget the reasoning but they said less injury and it is a lot easier to carry. They normally do about 4 load/unload operations a day. They noted mine was quite easy because of the containers used for packing. They said you would be surprised at how people just throw things into the back of a trailer. In the end, I would highly recommend ABF. Personally, I had no problems with them, even with the confusion about a ramp in Tampa. Plan ahead, listen to the advice of others who have used them, and take your time when it comes to packing your things. An ounce of prevention goes a long way. I hope this helps some of you and if you have any more questions, please feel free to ask. $7,000.00 for a 15' U-Haul from Seattle to Florida! I almost fell off my chair when I heard this quote. Penske is $4,200.00 for the same size. I can't believe anyone would be foolish enough to pay this price for a self move. We've decided on ABF Movers after reading the feedback on epinions although we have to pick up at a transfer station. We've checked out 10 full service movers and still can't seem to find one that we feel is 100% honest as well as affordable. 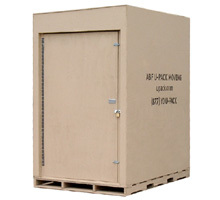 ABF U-Pack Moving Quote price is based on 16 linear feet for $3,544.00. Minimum charge is $3,019.00 if we use less space. Additional space over 16 is $175.00 per l/ft. Ramp rental is $75.00 and does not go to the final destination. They will drop off the 29 ft. trailer 2 days prior to departure and guarantee final delivery 7-9 working days (Mon-Fri + Holidays) to terminal. It sounds like a lot of work to transfer items to a u-haul and then to our house, but the price is pretty good as well as the great feedback on epinions.com. I will post an update at the end of our move around July 10th. ABF does not deliver to the city we are moving to. Since they are union, they only do front door delivery to certain cities. The main transfer station closest to us is Tampa so we don't really have any other option. It will be kind of a pain to have to unload to another truck, but after reading their feedback, we feel it's the best choice. Looks like ABF all the way. The hour is late and we just have to accept the facts that we'll have to do a transfer. It won't be so bad. The price is good and we know we won't have to worry about others trashing our things out. It's not all about cost, it has to do with feedback as well. Every full service mover we had quotes from, have horrible feedback. Where are the plenty of GREAT companies in Seattle? I've heard negative comments from friends/family members that have moved out of this area (Seattle) that have household items stolen, lost, broken and mis-quotes. One example was Bekins. They 'lost' over $3,000.00 of my mil clothing, plus one box of very expensive keepsakes on the way to AZ. A house to terminal is not the best way, but this is the only option we have with ABF since they do not service the area we are moving to. Moving from Seattle to Hernando County, Florida. No one in their right mind would CHOOSE this way, but when you don't have a choice what do you do? EVERY company I have received quotes from has horrible feedback on epinions! Full service movers are beyond our price range (over $5,000). ABF is $3,500. plus great feedback. ABF is dropping off our truck in 5 days. I made a call to the main office yesterday and begged them (lol) to deliver to our house. Waiting for a reply from the big boss in Tampa. We already know the price for the rental truck for transfer if we have to go that route. . . . The communication with this company has been excellent. Our 28 ft trailer will arrive next Tuesday and they will pick it up on Thursday and head to Florida. ETA is 7-9 business days. I will post here as soon as our move is complete. I could not be more thrilled tonight, thanks to the help I've found on this board and ABF Movers. The "Nutshell Version": We are using ABF for our move to Florida, but since we do not live in ABF's service area, we were going to pick up at the Tampa terminal, transfer to a U-Haul and then up to our new home in Hernando County. I didn't even think about calling the Tampa terminal to ask if they would do a turn around until Diane made the suggestion (thank you Diane!). I called them yesterday and received the great news today that YES, they will in fact deliver to our front door. The cost is $400.00 more but well worth it to us as my hubby is not in the best of health. Total cost of our move now is still less than $4,000.00 (Seattle to Hernando County, Florida) for 16 linear ft. / 7,000 pounds. This includes gas and taxes. Thank God I found this website! Final cost to us: $4,094.00 (15L feet) We were unable to be there when they picked up the trailer as they were running behind [so were unable to get credit for using only 15 rather than 16 feet]. We did not complain [about the $400 extra cost] as they agreed to deliver the trailer to our front door instead of us having to do a transfer at the Tampa terminal. ABF assured us a delivery time of 6-8 business days (not including weekends). Trailer arrived 19 days later (running behind again). * TRAILER - Trailer was not clean upon arrival (before packing). Driver told us to sweep it out. * BULKHEAD - Could not remove the bulkhead and after one hour of frustration, we called the Tampa terminal and asked them to please send someone out to help us. The dispatcher told us this is a common issue and they had no one to come and help us. He said we could SAW it off or BREAK IT off (these are 4" thick metal bars?) The movers we hired finally were able to knock it down after another 40 minutes of trying. * WATER - some of our boxes were pretty soggy and we could not figure out why. We realized that the top of the trailer is not solid at all, although upon first glance, it appears to be. Nothing was damaged beyond repair from the water, just very soggy. * SPIDERS!!! - We are not sure of which states our trailer went through. Upon unloading, the movers asked where we were from and said there were spiders on the bottom of the dressers. Upon further investigation, we found there was a hole in the truck floor right under one dresser. We are still unpacking and finding more spiders. We decided not to bring anything into the house until we check it over thoroughly. We had the movers put everything in the garage. In closing, I suppose I would have to say that YOU GET WHAT YOU PAY FOR! Would we use ABF again? My husband says yes, I say 'MAYBE'. I suppose no moving experience is perfect. If not for the spiders, I would say we would absolutely use them in the future. Diane wrote: To me, the most serious problem you mention is not the spiders (although they were obviously annoying) but the apparently leaky roof or at least heavy condensation. How could the boxes be soggy and still you had no damage to your things? Did the roof actually have holes in it? Actually the spiders are more than just annoying. We had to unload EVERYTHING into the garage not knowing if they are poison or not is another added worry. There were no visible holes in the roof, but obviously there was a leak somewhere. The soggy boxes were mainly linens and kitchen items, with the exception of our DVD box and I had wrapped the actual DVD in bubble wrap which saved it. Diane wrote: When you say it took 19 days for the trailer to arrive, that includes weekends, right? Yes, that includes weekends. I just felt that 19 days was a bit much since we were quoted 6-8 business days. Diane wrote: I had trouble removing my bulkhead as well. Supposedly the newer ones are easier to remove. Did you have the newer side-by-side type or the older top-and-bottom type, which is what I had? ABF needs to convert them all to the newer type. I agree 100%. They need to come up with a bulkhead that is much easier to install and remove. We had the one that sits on top of the other. Diane wrote: Also, another lesson I take from your experience is that it's probably a good idea to be prepared with a tarp for the trailer floor if necessary. My floor was clean and had no holes, but some of the trailers may be older. All in all, a mixed bag. I remember that Kara, also, made the remark that "You get what you pay for." People going into an ABF move should realize that it is bare-bones moving and they are accepting a certain amount of risk in return for saving some money. EXACTLY! I'm not so sure we really saved that much money in the long run. We had to buy air matresses, chairs to sit on, towells, TV, phone and everything else we needed that was on the truck. Ok, so we didn't NEED the TV, but we got one anyway. With the $$$ we spent on extras, we could have paid for a full mover. Diane wrote: Did you use less than 16 linear feet? If so, based on its original quote the company should have subtracted $175 for each linear foot that you didn't use. This is the problem (as I stated in my first update post) ... We DID NOT USE THE ENTIRE 16L ft, and since we were unable to be there when they picked up the trailer and took the final measurment, we did not see how it was measured. We measured out 16 feet and put tape lines at the 16ft mark on the walls to make sure they did not pack anything beyond that point. When they were done packing the trailer, I measured from the tape to the first box and it was just under 2 feet. In my estimation, we used 14ft and maybe 2 inches, but there is no way we used the entire 16ft. How can I prove this now? I can't. Diane wrote: You said in your original post (above) that they guaranteed final delivery 7-9 working days door to terminal. Although the trailer was delivered to your home rather than to the terminal, the delivery spread shouldn't have been 19 days (actually 13 working days if we subtract weekends). I was told over the phone that it was 6-8 working days. Diane wrote: That is 4 working days more than what ABF guaranteed (13 minus 9)--or 3 working days more, depending on how you figure it--anyway, it was too long a delay. From reviewing your earlier posts, I see that the trailer was picked up on Thursday July 1st, so I'm thinking that it was delivered on Monday July 19th, i.e. last Monday. Is that right? YES. Also, the driver made the comment that they were ONE WEEK LATE. HE said, "Oh, I see this was supposed to be here last Monday?" Diane wrote: I'm really sorry that you didn't have a better experience. I have posted everything you said (all your posts) in our ABF thread so that people can see what you went through. I DO NOT SEE ABF AS BEING SCAMMERS OR CROOKS AT ALL! The people of ABF were ALL very friendly and helpful. The drivers were real nice, the dispatcher was trying to be as helpful as possible about the bulkhead problem. I am not complaining about ABF ... only telling of our experience. I suppose I should have said right up front when they were getting ready to charge our cc that we did not use the entire 16ft, but since there was no way to prove it, I didn't say anything. The biggest annoyance FOR ME was the spiders and having to go out and buy things to be able to stay in our new house. Also, one important fact I left out and cannot stress enough is to COVER YOUR FURNITURE with PLASTIC!!! Our furniture is ruined because we did not take the time to cover it well. Do not just put blankets/tarps down. Wrap it and then tape the wrap so it is totally secure. Diane wrote: I gather that you agree that ABF held to its quote on the cost of the move except that they should have charged you less because you used one less linear foot of space. <snip> I guess the lesson is that people should try their best to be present when the trailer is picked up. YES, I agree that the quote was accurate with the exception of 22 inches of unused space. If there had been anyway possible to be present when they picked up the trailer, we would have been there. Once we had everything packed up and ready to roll, we needed to leave as we had our 2 cats waiting in the car plus a hotel reservation 200 miles away and it was getting late. I do agree that if possible, the person should be there when they pick up the trailer. Diane wrote: I understand that the estimated time of arrival of your trailer was (on the official paperwork that you quoted in your first post) 7-9 business days after pickup and (unofficially, according to what was said to you on the phone) 6-8 business days after pickup. You also say that the driver who delivered the trailer told you that it was supposed to have been delivered on Monday, July 12, rather than a week later. Diane wrote: However, I agree with you that you experienced a significant delay for which you should be compensated and I hope that the company will see it that way too, especially since you were inconvenienced by having to buy air mattresses, chairs, towels, and so on. The soggy boxes were mainly linens and kitchen items, with the exception of our DVD box and I had wrapped the actual DVD in bubble wrap which saved it. But in your last post you say, "Our furniture is ruined because we did not take the time to cover it well." Ruined furniture is different from soggy boxes of linens and kitchen items, and much more serious. NOT THE FAULT OF ABF. The furniture became BLACK from the floor and walls. The couches should have been fully wrapped and taped to insure complete protection. Diane wrote: Did you have to pay extra to the unloading people for the time they wasted trying to remove the bulkhead? NO. The movers had a minimum charge and it only took them 2 hours to unload so it was within the time frame. We also helped them unload as it was raining and we wanted to get it done as fast as possible. Diane wrote: Thanks for saying that the drivers and dispatcher were nice and that you aren't complaining about ABF. . . Again, I am very sorry that you had these problems. Thanks Diane ... We certainly appreciate the help! I'm happy to report that after contacting ABF and telling them of our moving difficulties we were contacted immediately and offered compensation. In my opinion, any company that takes the time to 'hear' a customer and offer to make things right absolutly deserves a good report and perhaps a second chance in the future. I'm glad to see the positive comments about ABF... we're moving from Minneapolis to Portland, OR next week, and we're doing the U-Pack thing. We're terrified about properly packing the trailer. A couple tips about moving supplies. First of all, stretch wrap is God. You wouldn't believe how many things I've used it for. Besides the obvious things like wrapping up CD towers and binding bookcase parts together, I've also discovered that if you wrap it around all your ordinary boxes (sealed with tape), your boxes suddenly have "treads" on the bottom and are much less likely to slide around. Another tip is to look in the good ol' yellow pages under Moving Supplies and see if there are any places in your area that sell used/overstock boxes. We haven't paid more than $1.50 each for our boxes, and most of them are quite sturdy. We even got some nice small ones for $0.25 each. We were also able to get some used furniture pads (who cares if they're used?!) for less than half the retail price. . . .
For those in Minneapolis, the used boxes are at Western Container, and the $9 used pads are at Moving Equipment Sales on 98th in Bloomington. Our hand truck cost $20 at Menards. One drawback of it so far: the rubber tires stink to high heaven! We can't even keep it in our apartment. Here's a question I haven't really seen answered: everyone has said that unloading is much quicker than loading... but how long does loading take? We're going to have three or four people loading about 12 linear feet (a well-stocked 2-BR apartment). How much time should we count on? Well, my ABF odyssey has begun. They were supposed to drop off the trailer between 3:00 and 8:00 today. I called at 3:00 to make sure it was still scheduled properly, and they assured me it was. Then I called at 7:45 to check again, and they said they were running late. They finally arrived between 9:00 and 9:30, and the guy said he had two more trailers to deliver tonight, in FAR-flung suburbs! So, in summary, the bad news: the trailer came considerably later than I was told, and they failed to call me when it was en route. I didn't really need it at any particular time today, but it was annoying to be stuck here for six hours, waiting (and starving!). Tomorrow's the big loading day. I'll report back here with how many people we had, how many feet we used, and how long it took. Here's what we have to load: 2 big desks, 2 dressers, 3 coffee tables, a dining room table and 4 chairs, a full-size bed, a couple chests, 2 assembled bookcases, several disassembled bookcases, a file cabinet, and I'm guessing about 70-80 cardboard boxes. Anyone wanna place bets on how long it takes? . . . Okay, it's done. From unloading the ramp [we did use a ramp to load; it would have been pretty much impossible without it] to slamming the doors shut, it was four hours. We had myself, my wife, my 18-year-old brother and one of his friends, and a very tall friend of mine. We ended up using exactly 10 feet -- or so we think; they haven't picked it up yet. If we had really packed it perfectly, in a solid 8'x9' rectangle, we probably could have gotten away with 8 or 9 feet. (We didn't pack our sofa or our big wooden hutch.) As it was, we had it almost all the way to the ceiling in the nose of the trailer, sloping down slightly from there, but we tied it down with some rope, and I think it's pretty stable. I HOPE it's pretty stable; I guess we'll find out next week! For padding in our ABF trailer, we had a few used furniture pads, a couple old sleeping bags, and a whole lot of old vinyl-and-fabric lawn furniture cushions that my mom didn't need anymore. Frankly, though, the real pads were the best, because they're thin, tough, and flexible; they won't protect your stuff from big shocks, but they're great for preventing scratching/scuffing. Whatever you do, don't buy stuff from allboxes.com; there's a link to them on a lot of sites, including ABF's, but their prices are outrageous, especially if you don't mind looking around locally for "gently used" boxes and pads instead. . . .
We didn't even use the shrink wrap on loading day, believe it or not, as stuff was packed tightly enough that we were able to let friction and gravity do their thing. In other words, we didn't put the furniture pads on prior to loading; we stuffed them into cracks once everything was in place. Maybe this will turn out to have been a mistake; I guess we'll find out next week! [The trailer] was clean... there were some little wood crumbs on the floor, but no big deal. And it was pouring rain when they dropped it off, but it didn't leak at all. The bulkhead was a piece of cake. It was a two-piece side-by-side one, and we never even took it apart. The driver who dropped the trailer off picked the whole thing up by himself and practically threw it to the side of the trailer; apparently he was a pretty strong guy, because it took two or three of us to position it when it came time to put it back! So it's heavy, but not difficult at all; the ratcheting hydraulic "feet" work brilliantly. This is the sort of thing, of course, that might vary greatly from one ABF location to another. I won't be able to provide any updates until next week when our stuff arrives -- until then, it's out of our hands. Which is both liberating and scary as hell! In theory, I should end up paying $1449 . . .quite similar to the quotes we got from Budget and Penske. So why ABF? Well, either way, we'd have to pay for moving supplies and we'd have to do the loading/unloading. Either way, we'll need two nights' lodging on the road. But driving our Hyundai means $100 in fuel as opposed to $350. Also, we wouldn't be able to take our cat in the truck, so it'd cost about another $150 to send her on a plane! So we're saving maybe $400, and we don't have the stress of driving a monstrous truck across the windy Great Plains. When I called to schedule our trailer delivery (for Friday), they didn't mention extra charges [for storing the trailer] to me, and frankly, I can't imagine they'd do that to us, given that our stuff arrived a full three business days before their estimate. Well, I'm in Oregon, and our stuff is in our new house, and I have nothing significant to report; this is a good thing. It seems the ABF terminal here in Portland is a little better organized than the one in Minneapolis, because when I called to schedule delivery of our trailer, they had 2-hour blocks of time for me to choose from. I told them I'd like it here between 12 and 2 on Friday, and it arrived at 1:15. (Fortunately, our four helpers all arrived around that same time!) And, thank god, there was a ramp. When we opened the trailer, everything looked more or less like we'd left it, except a couple of lighter boxes had tumbled down from the top. Yes, there was some minor damage to some of our furniture: some bookshelves got scratched, and the handle on one of my desk drawers got blasted to pieces. But -- and I cannot stress this enough -- this was not ABF's fault! If we had invested in a few more heavy-duty furniture pads, I'm sure our stuff would have come through unscathed. All of the boxes marked "Fragile" came through just fine, because we packed them under or in sturdy pieces of furniture (like desks). Oh, and by the way: as I suspected, the fact that our stuff arrived 3 days early and sat at the terminal all week wasn't even an issue. Thanks to this web site, I just found out the mover I chose (Ben Hur) is not reputable. So now I have to find a new one. I am going to be moving in with someone in Florida and had planned to sell most of my stuff. I only wanted to take the few pieces of furniture that are meaningful to me and clothes and personal effects. Ben Hur estimated 240 cf at $4/cf. Everyone else had quoted by weight. Before I found Ben Hur, I had a quote of $1700 from Movex, $2200 from Box Brothers, about $2200 for UHaul... I really liked the idea of Ben Hur being full service, as these other options are all self service. Any one have any other ideas for me? Matt, just want to mention that if you have 240 cubic feet, that's 3 to 4 linear feet. ABF has a terminal-to-terminal service with a 3-foot minimum. You would have to take your stuff to one of their terminals to load it and go to another terminal to get it, but I think it would be quite inexpensive, probably less than $1,000 judging from what other people have told me for a similar length move. I guess you just have to decide whether the hassle factor is worth it. For door-to-door, ABF has a 5-linear-foot minimum as you probably know. . . . There is supposedly a $50 off coupon for ABF in the USPS change of address packet, and an ABF spokesperson told me that you can sometimes use the ramps at the terminal free of charge if you get the people on the right day and smile at them. Or you can back the small van right up to the ABF trailer so you don't even need a ramp. I just sent ABF a quote request for their container service. I did their size estimator, and it came to 3 feet, so their site suggested that option. After I get the quote, I'll call and ask about options of plain terminal-to-terminal. . . .
Well, ABF is really pushing the containers! I got an online quote for $1200. Then I called and said, "I really only need 3 feet, maybe 4." And the quote guy told me $795 for 3 feet, and $195 per foot after that. I said I would do that, and he transferred me to the schedule person who said they really want to get people using the containers since it's a new service, and she would give me the container for $795. And then she said she would re-adjust my quote so I could complete the quote on-line and save another $25. So my reservation is made. I was so bummed this morning when I found out the truth about Ben Hur.. now I am feeling a lot better! And I will be sure to report fully on my experience. Well today was moving day.. and I had a couple of problems. First, the local guys I hired were not exactly quick.. In under 1 hour, everything was down from my apartment and on the street waiting to load on the truck.. and somehow it took another hour to load those last few feet even though they had everything they needed... they really seemed to be stretching the time, and one of them had his dog with him..and if my friend had not been out front watching my stuff, the dog would have tinkled on my sofa! And once we got to ABF, the dog was underfoot. So I am not going to recommend these guys to others. My 3 cushion sofa and chair would have barely made it in..and then there would have been no efficient way to pack the boxes. I could only recommend this method if you have some small furniture pieces and boxes. Load something like a full size sofa and you will have a lot of trouble. So I had to go to the dispatcher, and ask if I could load a trailer the regular way instead. And because they were anticipating just loading the pod onto a trailer, I had been assigned one of the oldest and grossest trailers. The people beside me were all loading nice brand new trailers.. but it was either that, or wait for another loading day...which was impossible at that point. You could see through the wooden parts of the load floor to the ground at many points.. and the side walls had some pin point holes (luckily all behind where my stuff is)..and the floor was just so dirty. Perhaps this is common for ABF and the LA terminal is lucky to have newer trucks available for those who plan this in advance? The LA terminal puts the trailers in a parking lot across the street from the main "yard".. and that way you have your 2 days to load without needing access to the yard.. Personally, I would not have felt comfortable leaving it there overnight. I had my local guys back their truck up to the trailer and they put their ramp in between and just moved my stuff over to the trailer and I sent them on their way. Thank god I had a (a really good and understanding) friend with me. My stuff would have loaded into 3 linear feet as planned... but I decided to spring for an extra foot to not have to pack so high and worry more about load shifting. (Remember, my original plan would have had everything in the container.) I packed everything as tight as I could, put two eyelets in the floor and ran some rope from the ceiling beams...called the dispatcher and a driver was there in about 10 minutes. We put up the barrier..which also did not give me the best confidence about its ability to stay in place as it was as old as the trailer, it seemed... he hooked up his cab and drove off. I tried to tip the driver because the barrier was really hard to put up (due to age of the thing) but he would not take it. I have no beef with ABF. The dispatcher was friendly and efficient. They run a tight ship. I do have a beef with upack and the way they represent the container size. When I call tomorrow, we are going to chat about that. I was lucky I had brought lots of old pillows and things to stuff in the crevices to keep everything tight..and I also had plastic to throw over the top.. although that won't do much good for the dust that's going to come through the floor. Thanks to tips on here, I bought the really cheap mattress foam toppers at a discount linen place - and they were having a sale - and I had fully wrapped my couch and recliner in those and then stretch wrapped them... K-Mart has twin size acrylic blankets for $5.49 each. I feel sorry for anyone who actually has to use them as bedding, but they worked well for wrapping my tables and using in the load. Box City in West LA is a great place for all your moving supplies. They are very friendly, the prices are great and you can return anything that is still in "new condition" - even boxes...just save your receipt. I overbought, so that is a great thing. My partner is meeting the truck at the Miami terminal... so I'll have to wait and hear how it goes on that end and report back. As for dimensions, I overstated the foot and a half thing probably after I thought about it some more. In terms of depth and width, the way the 2 x 4's are configured inside, plus the thickness of the plywood on each side, you lose about 10 inches. In terms of height you lose a bit more than that, because the bottom has been constructed to accept a pallet jack. My 7 foot sofa, a large recliner, a kitchen table base and 4 kitchen chairs, plus an assortment of boxes and small TV would have easily fit in 3 linear feet [on the ABF trailer itself], had I been prepared for it by bringing more bracing material to stack higher. Because I was expecting to fill the container, I had not been worried about stacking things so vertically up to 9 feet in the trailer. Since I could not use the container, I had to decide whether to risk the stack being so high, or get the extra linear foot and reduce the height of my load. I decided to reduce the height of my load. My stuff would never have fit in the container. It is not the dimensions advertised (at least on the inside). I would say if anyone is considering this type of move, they go to the terminal ahead of time and open one up and see for themselves. I wish I had. . . .
My biggest concern remains the condition of that particular trailer, and just being more worried in general about my stuff not being in a locked container and more subject to load shifting, etc. GOOD NEWS - I spoke with ABF and they said they were offering the deals because they are trying to get feedback on how the containers are working. He said he fully understands, and was sorry I had such a hassle with the trailer. He's going to reprice my move and knock about $200 off my original 3 foot price. So that makes me feel a lot better and clearly this is a company that cares about their reputation. Upack called my partner two days ago and said the truck would be in Miami on Thursday [July 22]. That was the first estimate I was given, too, at the start of the move. Luckily, I had told my partner to plan on a Monday [July 26] pick up since he had to make arrangements with a local mover, and I wanted to be sure the stuff was there, and this fell within Upack's 2 day window. Because I just called the Miami terminal to send them an authorization to release my stuff to my partner, and they said the truck would actually get in tonight. I spoke to the Miami terminal and they were very friendly...faxed them my authorization and should be all set. Will let you know the condition of my stuff when he gets it. HOORAY - My partner opened the trailer today, and he said the hardest part of the pick up was removing the barrier. Apparently my stuff did not shift at all, and nothing was dirty or damaged. The movers he hired, backed up their truck to the back of the trailer, and it was transferred in about 25 minutes. So in the end, I have nothing but good things to say about ABF. After a nightmare scam with NationvanLines for over 6 months I got most of my things back. I had some furniture left so I used ABF from Terre Haute, Indiana back in June and had a wonderful experience with them. They were extremely courteous, the price was great, and my furniture arrived exactly as promised. I would use them again and recommend them as well. Hi. I am moving my stuff from Berkeley, CA to Brooklyn Ny in August and have made a reservation with City to City Movers. You pack up a crate and they pick it up and drop it off. 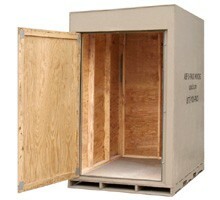 They have quoted me $1600 for one crate. Has anyone worked with them? Are they good? Based on the information and recommendations I read on this site....we skipped City to City and used ABF. We did one of their new container moves and it was only $1051 from the terminal in Oakland, CA to the terminal in Brooklyn, NY. We spent about $100 in Uhaul fees to get our stuff to and from the terminals but did the moving and packing ourselves which saved a lot of money but was really hard work. The container was small. We had to leave behind a large futon, dining room table, four chairs, large desk and leather desk chair and a large stereo. We brought a queen size bed, two dressers, two end tables and about 30 boxes. It was certainlly NOT big enough for a one bedroom apartment. You have to have a very limited amount of stuff to use these things. Next time we will use the bulkhead. However, ABF was GREAT!! The move was fast, we tracked it online and they showed up right on time! We will definately use ABF again and are very pleased with them. Thanks to everyone and good luck. U-Pack from Toms River, NJ to Frisco, TX. Total cost for 12 linear feet was $1495 and that included a ramp at both ends. I contacted the dispatcher in Toms River , setup the delivery time, they were there on time to drop off the trailer. I used LaborReady.com for some cheap help, $15 an hour per person, 4 hour minimum. Contacted ABF when I was finished that afternoon, they came that evening to pickup the trailer. Picked up on Monday evening, arrived in Dallas on Friday, dropped off on Monday afternoon and picked up on Monday evening. Used Labor Ready again for cheap labor. All in all a great move, If I ever have to move across country, I will definitely use them again. My girlfriend and I moved from Boston to Phoenix and decided to go with the ABF Upack Mobile container. There has not been much on discussion boards about this so I hope this helps some people. The container we had seemed brand new, so I assume they don't do these often. When we went to fill it up we thought it was too small, but it fit all of our stuff, which was probably equivalent to a 1br apt. We did not put anything too big in like mattresses or couches. Almost all of our furniture came apart, which made it fit much easier. If you have lots of Ikea furniture this option is good because they have lots of space on the sides where the 2x4s stick out, but big enough for furniture pieces. The container was the cheapest method we could find for such a long haul and it actually came a day earlier then expected. Overall it only took 5 business days, which was much better then any company. One word of advice if you do use this make sure everything is tightly packed inside or that everything inside boxes etc are tightly wrapped. There seemed to be a lot of movement of things, but luckily nothing broke. When we got to Phoenix we knew it would be hot and with our apt being on the 3rd floor (and steps being outside) we knew we would kill ourselves if we did all the moving. I rented a budget truck, loaded it up, and had people from Labor Ready come the next day and unload the truck. They were good, quick, cheap labor. We tipped them well for their efforts, but it was a very good deal and one can get them sometimes 24 hours in advance. The ABF move cost us $1640 and labor ready was $15/hr per person and you needed a minimum of 4hrs. We got 2 people and they finished the job in about 2-2.5 hours and took a few breaks because of the weather. [Editor’s note by Diane: The mobile container seemed new because this is a very new service that ABF is offering--I think they started it only about 6 months ago. Also, Sam was really lucky to get the equivalent of a 1BR apartment into the container, since it's only 7 feet by 8 feet by 5 feet, and those are EXTERIOR measurements. I notice, though, that he didn't try to ship a mattress or large furniture, and that he disassembled a lot of the furniture. For anyone who may be considering this option, it would probably be a good idea to go to the terminal in advance to make sure that the container is large enough for what you have to ship. One person who posted here, "mattinla" (ABF review #7), thought he was going to be able to use the container but when he got to the terminal, he had to shift to a regular trailer because all of his stuff wouldn't fit. And because he was coming in at the last minute, the only trailer available was sort of ratty, although his stuff made it through just fine. As I have a very small move only 35 boxes and some very lightweight Ikea furniture, and a brother who is flying in to help, I opted for ABF terminal to terminal. Most of the van lines were quoting the outrageous prices because I live in an area in the mountains that is quite inaccessible to large trucks so some of that cost of 3,000 would have been for shuttle service. Even without that, it was starting out at 2400 right off the top for a trip from San Jose to Austin, Tx. I'm going to rent a local Penske cargo van for a few hours (minimal cost ..and thanks again to tips on this site for how to get the online discount), and take my belongings to the ABF terminal in San Jose (I live about 30 minutes outside of town in the mountains). I have pick up on the other end –Austin (family has a trailer on the TX end to take my stuff to public storage). Total cost is about 689 for 3 ft on their truck which is just about right for my move. 6 ft. was 1200, still not a bad deal at all. In the past, I've moved myself with Penske trucks but going across country with the few small belongings I now have (got rid of about half of my household of goods when I moved from S.F. to the mountains), just was too prohibitive. . . . Anyway, if anyone else lives in an area that Broadway Express or other do it yourself vendors cannot access with the large semi trucks, keep in mind the terminal to terminal options that ABF and some of the other U-pack it vendors offer. Thanks again for this wonderful site! I'll let you know how it turns out when I complete the move. I double checked with ABF; the mobile containers are actually more for me because I only intend to use 3 ft on their trailer and the mobile containers have more cubic space so cost a tad more than doing the 3 ft. I'd be paying for space on the mobile that I'm not using. Also, mobiles are not always available at all terminals (in my case they weren't available at my point of origin), but it's so good to hear that others have gone this route with success. So, I"ll definitely keep it in mind for future moves. I wanted to report that my move with ABF went great. I rented a cargo van from Penske to move things from my home to the terminal truck. Penske was wonderful in that they knocked 50% of the daily rate because the van's latch was stuck and it took all of 20 minutes for a tech person to fix it. What great customer service to compensate me for that extra wait time by adjusting my rate. Then, ABF, who had quoted me a minimum of 695 for my move, dropped my rate over $100.00 when I was able to squeeze my belongings into only 3 feet in their van (originally I had estimated 5-6 feet when I asked for their quote). So the trip from SAn Jose CA to Austin TX only cost $570 and that reflects a $25 discount for having reserved the move online. So if you all do ABF, be sure to reserve on their website to get the $25 discount. Also, it does take two people to put the bulkhead in place, but once secured, it was great. My things arrived in great condition with no damage (of course I packed myself very well and used store-all boxes which I had collected over the years). I can't emphasize enough how nice these boxes are in terms of strength when you want to stack them high (floor to ceiling is how we got so efficient with space). So grand total for the move from San Jose to Austin to move a studio worth of belongings was a whopping: $725.00 including van rental and ABF, and personal cargo insurance. I had budgeted $1500 for the move. Needless to say, the savings allowed me to splurge and take a leisurely drive across country and vacation at some nice hotels in the Southwest. This was one of the best moves of my life...and you're talking to someone who moves every 2-3 years. I just read Liz Pulliam Weston's "Don't get scammed by your mover" with a link provided to this site and felt compelled to share my recent move w/ UPack. Despite the height of the trailer, I backed the U-haul truck up and was able to just pass things across. Now I used to process moving claims for the Army and believe me I have seen many, many moving horror stories (things falling off of ships, containers with mice, etc). The Manager and staff at the Elkridge plant were very accommodating, didn't charge me for an extra day to get the stuff out of the trailer. I think more people asked me how I felt or if I needed anything at Elkridge than I could count. I never touched bulk-heads, the mgr in his suit climbed up the trailer and took it down. I Highly recommend them, just budget for a full body massage once you get your stuff of the trailer. Best Wishes & Happy Moving to ALL. We moved from Denver to Portland OR. Our ABF quote was for 16 linear feet for $1499, a price of $90 for each additional foot, and a minimum price of $1299. Looking back at my bill, I just realized that they did not charge me for the ramp on either end (must be an error!). I also got $25 off the price for booking on-line. We ended up using 20 rather than 16 linear feet in part because of the poor loading (see below). I did make a few phone calls to ABF's customer service number and every time they were patient and helpful -- I swear they must get asked the same thing over and over. They were courteous when picking up and dropping off the trailer and always arrived on the earlier side of their time estimate. Just be sure to wrap all of your belongs to prevent any damage from rubbing. As to the packing....we used USA Packing by following a link on the ABF website. They were the least expensive of the three services listed there and the least ambiguous about what was included, additional charges, etc. I paid them $1239 and I wish I could give them a better review because I think their intentions are good. The packers they contracted for us in Denver started out great but by the end of the day they did not do nearly as good a job packing the boxes or the truck. My spouse had to leave the house unexpectedly which left me keeping an eye on both the boxing and loading of the truck; I just couldn't do both. As a result, we had some damage to our furniture from rubbing. I photographed the damage and filed a claim with USA Packing. They were professional about it and did pay me for the damage but I had to remind them to send the paperwork and send the check. I honestly think this had more to do with staffing issues than trying to skip out on paying me. The movers they had arranged to unpack in Portland were great -- absolutely no complaints.